A fine art print of "Mysterious Gorge" makes a great focal point for a social room, office or man cave! Multiple waterfalls, dark walls and a graceful stone bridge combine to make dream-like magic in the soft morning light. Let the water take your breath away! 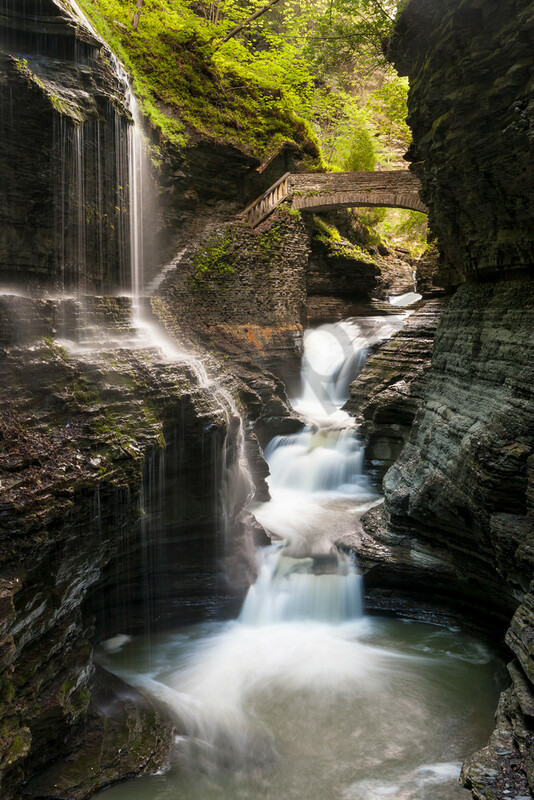 The Gorge Trail hugs vertical stone walls as it follows Glen Creek through Watkins Glen State Park. Winter's record snow pack is melting and swiftly flowing through the cavern. I climb stone steps, duck into tunnels and navigate narrow passages. Passing beneath a veil of water I meet Rainbow Bridge at the top of the trail. Built of native stone by the Civilian Conservation Corps (CCC), the bridge sets a graceful arc over the powerful falls below. "Mysterious Gorge" is part of my Waterfall Wall Art series. Best displayed as a metal print, the deep colors and bold textures come to life, captivating the imagination. Each metal print is ready to hang without a frame, providing a bold, modern look. For a softer, more pastel appearance, choose a canvas print. Two museum-quality fine art papers are also available, should you prefer a more traditional look.